The larger basket in this picture is made to order. It is what I call the Honey Pot Basket. It is stained with golden oak and varnished. It is decorated with a braided leather band and a dream catcher. It is larger than the Bee Hive Baskets below at 11 inches across and 13 inches high. This is my "Bee Hive Basket"
9 inches across the top and 12 inches across this bottom. It is hand dyed ans woven. The Thunderbirds are hand painted. It also has a stran of leather cord woven in. 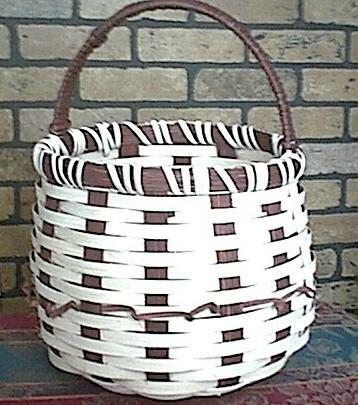 These baskets are made to order with 10% down. Measurements may vary somewhat because each basket is slightly different, but will be made basically the same size. 10 inches across the top and 13 inches across the bottom. It is hand dyed and woven.